1. Preheat the oven to 200°C, gas mark 6. Butter and base line a 20cm square baking tin. 2. Sift the flour, baking powder and salt into a large mixing bowl, then stir in the cardamom seeds and sugars. Add the eggs, vanilla and melted butter, and mix lightly, then fold in the chocolate chunks and two-thirds of the pistachios to give a soft consistency (being careful not to overmix). 3. 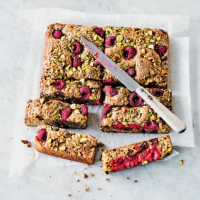 Spoon into the tin, level the surface and scatter over the raspberries and remaining pistachios. 4. Bake for 25-30 minutes until just cooked through but still a little sticky on top. Cool in the tin, then cut into 12 squares and serve with thick yogurt or in slices with coffee.